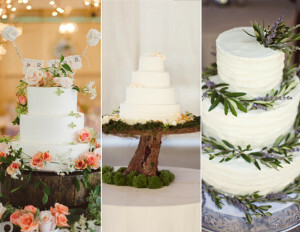 Today, I am so excited to share with you a fun piece on Wedding Cake Trends for 2016! 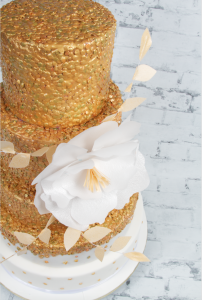 We joined forces with Dubai based cake decorator, Mona Abou Ghazaleh from Cake Land Dubai and asked her to share her thoughts on the most sought after cakes this wedding season. I am so pleased with what she had to say, and agree with her every bit on what it is brides are after. 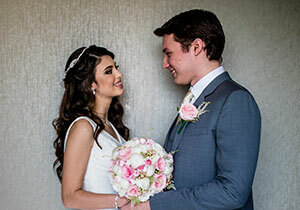 The UAE has such a wonderful variety of brides with a great mix of styles, it is so fun to be able to cater to all of them. 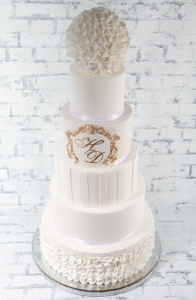 We hope you enjoy her piece..
As in the world of haute couture, wedding cakes have their own trends each year. In this article, I share with Cloud 9 readers, some of these trends for 2016. 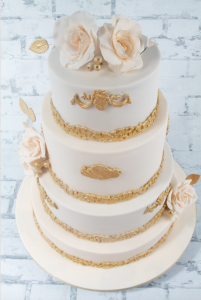 Remember, your wedding cake is an important feature of your big day as it is the centrepiece of the celebration. Doing your research well ahead of time and taking your time to choose the “right” cake will certainly pay off. Metallic accents continue to be in high demand. 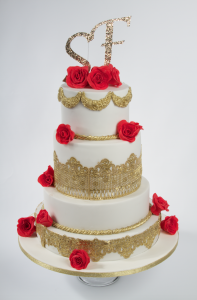 Brides form all over the world seem to fall in love with the touch of bling on their wedding cakes. 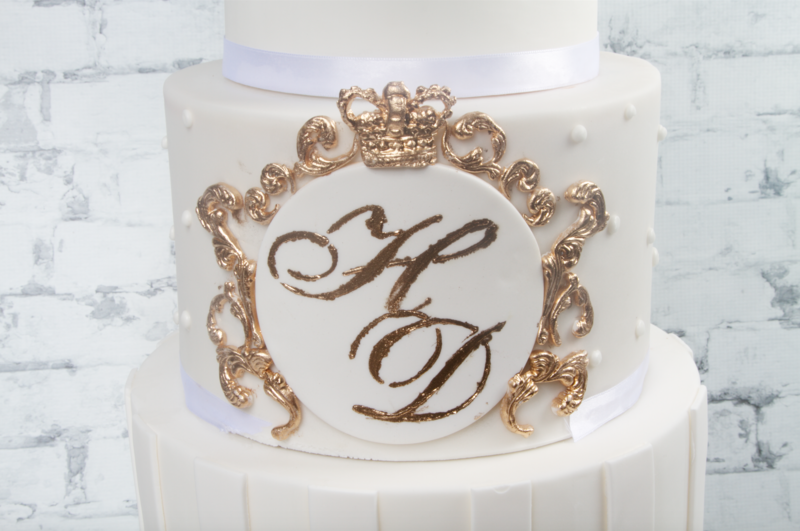 Edible gold and silver colouring is applied to sugar embellishments or lace to add glamour and light to the whole cake, especially when applied in the right proportion. Taking from the glamour finish to your wedding cake, sequins in various sizes and shapes are making a strong appearance in 2016. 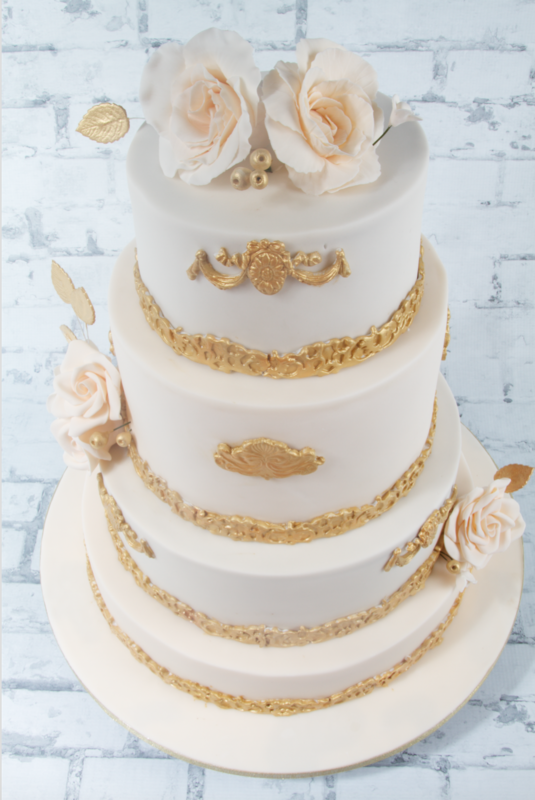 Think of little jewels adorning your wedding cake! Metallic coloured sequins in silver, gold or bronze are the most popular. 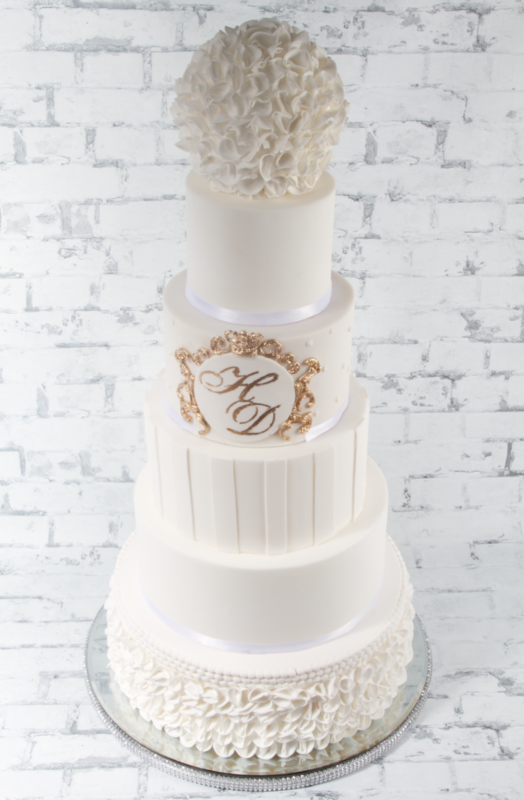 Tall cakes have a special presence and can be the focal point of any wedding. They capture the eye instantly. By tall, I mean six tiers or more. Artifical cake tiers make it quite possible to have as many without breaking the bank and any cake being wasted. If you’re looking to “wow” your guests, tall cakes are the answer! An all-time favourite, and a classic that never goes out of fashion. Flowers add a rich and romantic touch to your cake whether they are made of fresh sugar or wafer paper. Roses and peonies in particular are very popular with the brides. Sugar flowers and beads arranged in pretty sprays are certainly the way to go. They are a lot of work though, so expect the cost to increase with the addition of more flowers. Going back to basics with the elegant effortlessness of naked cakes. Its hard to believe that a make-under can significantly add to the décor aspect of a wedding! For those who don’t know, this is a creation that forgoes an outer layer of buttercream, so that the texture of the cake and the colors inside are put on show. This cake instantly draws the attention to the flavor. Albeit vanilla is the most popular, we are witnessing flavours like red velvet or even chocolate take centre stage. Naked cakes go hand in hand with fresh flowers to make for a dreamy sweet delight. This is a cost effective option if you’re looking to save a little bit here and there. Cake lace made its first appearance in the last couple of years and managed to stay in trend this year too. Think doilies, daisies, soft decorative lace and all things vintage! A strip of lace in various designs hugging tiers of cake speaks a million words of love, passion and longing! Cake lace comes in any colour you can think of offering you a limit free palette. How to choose? With this many options and trends, it’s easy to get confused and lose track of your own thoughts. 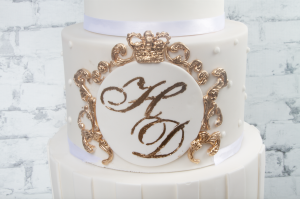 The best thing to do here is to bring your cake decorator together with your wedding planner and have them work as a team to bring your vision to life. A successful theme is where all elements work in harmony and compliment each other.